They say variety is the spice of life – but apparently that doesn’t ring true when it comes to lunchtime. In fact, one in six people admitted they have sat down to the same lunch every day for at least two years, blaming a lack of inspiration and the need to save money. 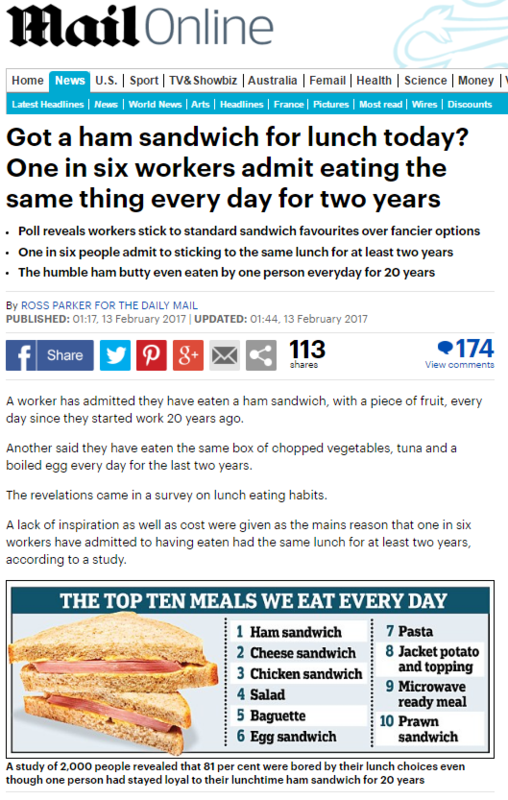 A worker has admitted they have eaten a ham sandwich, with a piece of fruit, every day since they started work 20 years ago. Another said they have eaten the same box of chopped vegetables, tuna and a boiled egg every day for the last two years. The revelations came in a survey on lunch eating habits. Who eats the same lunch every single day of the year? Well, people who are filling in online surveys as quickly as possible without considering their answers in order to make minuscule amounts of money, that’s who. And who is this headline in service of? 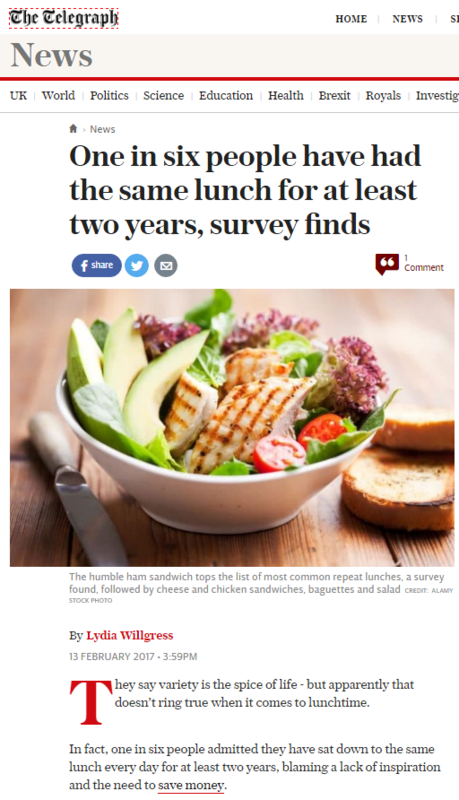 The study, which was carried out by New Covent Garden Soup and polled 2,000 people, also revealed a staggering 81 per cent of people are ‘bored’ by their lunch choices. In case you’re wondering, yes: New Covent Garden Soup do make soups that you can have for lunch. They probably have enough of a range that you could have a different one each day of the week, I imagine we’re meant to spontaneously think. This entry was posted in New Covent Garden on March 11, 2017 by Michael Marshall.